Finding a responsible, financially healthy and customer-friendly automaker that pays their sponsorship bills these days isn't easy. That's why it seems Legoland has traveled the world in search. 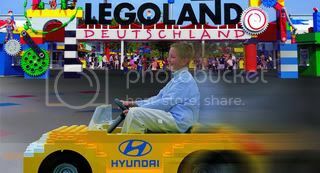 With the U.S. auto industry in flux, a Swedish automaker's sponsorship of Legoland California doesn't seem that far fetched, but then we got wind over the weekend that Korean automaker, Hyundai, was signing up as the official auto of Legoland Deutschland and we started to wonder. Germany, of course, long known for being completely berift of proud automakers. As it turns out, Legoland features a wide array of long distance relationships, each official sponsorships for the auto category at these respective parks. When you consider that Lego doesn't even own a majority stake in Legoland itself, this doesn't sound all that strange (Blackstone Group, under its Merlin Entertainments brand, owns a 70% stake with Lego Group retaining 30%). 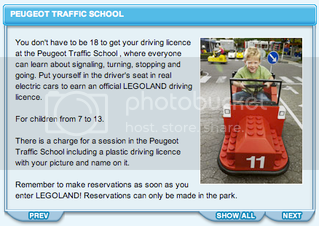 A staple of each relationship is the "[insert ignore brand] Driving School" which features life size [insert ignore brand] replica car models of the sponsor's choosing made to look like LEGO bricks. 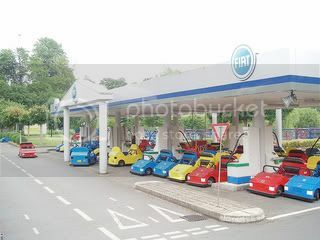 These cars, while not entirely made of legos, can be driven throughout the attraction and emphasize driving safety. Next up - Legoland Florida (2010), Legoland Malaysia (2012) and Legoland Dubailand (2015). Any guesses as to which automakers might pop up there? Toyotas will surely be safe by 2012, but Buick seems to better fit the trend. If only GM were better with long term/distance relationships.